A ruthless collector of magical artifacts seizes the Monkey King's sacred homeland, jeopardizing the very balance of the universe and triggering a Librarian mission to save the imperiled land. TV Fanatic review - Well. Um. So, that happened. 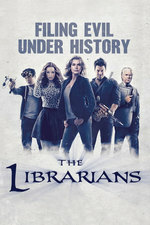 I'm really of mixed feelings about The Librarians Season 3 Episode 9, to the point where I can't decide – even sitting here writing this review – whether this episode was good or completely ludicrous. Here dude, put this gun tattoo over your fireplace on your arm. Chekov's ink!